Powerful/complexing submitted by alleywater on July 2, 2017, 6:45pm Start takes you on a journey of her two worlds and how she navigates them. This book is so relevant and powerful that it should be standard reading for any high school. This book speaks on topics that need to be discussed and understood and I think that this book could start those discussions. An Absolute Must-Read! submitted by zixyxuan on August 31, 2017, 6:49pm Everyone was raving about this book, so I was really worried that I wouldn't like it as much because my expectations were already set so high. But this book was definitely worth the read and I would recommend it to everyone. This book is inspired by the Black Lives Matter movement. It centers around Starr Carter, who witnesses one of her unarmed friends shot by a white police officer. What I like about this story is that it doesn't only focus on the aftermath of the shooting, but it also gives a thorough perspective of the difference between rich and poor neighborhoods, local gang wars, and Starr's interactions between her school friends and boyfriend. For example, Starr's dad used to be the leader of a local gang and how he continuously tries to seek a better life for his children after being released from prison. She also has issues with opening up to her white boyfriend, who claims to understand racial tensions, but at the same time asks her why black people have weird names. Really? Again, I can't emphasize how this book is such a phenomenal and powerful read, especially with the current political climate in the United States. Starr is really funny and I appreciated all of her Harry Potter jokes, but there are also heartbreaking moments when I feel how frustrated she is with the state of her situation. A complex take on a complicated issue submitted by EJZ on June 18, 2018, 8:34pm I read this after reading Baldwin's "The Fire Next Time." What a great novel, telling the author's truth in a brilliant heartbreaking manner. It's so relevant today, and it will remain relevant unfortunately for the foreseeable future. As a suburban white man, I can't completely understand a black child's reality in the city. But this novel helps. Compelling book for young adults and not-so-young adults submitted by gailjweber on June 27, 2018, 11:10pm I checked out this book on the recommendation of a friend, and I didn't want to put it down. I am not YA age but the main narrator's voice sucked me in and was really relatable. I would recommend this for high school age and older based on some mature content and disturbing events. MUST READ submitted by cjlandefeld on July 17, 2018, 8:43am The Hate U Give is one of the most powerful and relevant books of the last decade. A must read for teens and adults. 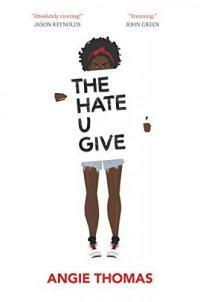 Excellent Book submitted by allie0 on July 20, 2018, 7:56am The Hate U Give is relevant to current events and extremely well written. Though the topic is a hard one to digest, the book is impossible to put down. A must read for YA and adult readers. Must read submitted by Jinxyluis on July 24, 2018, 8:41am This book is perfectly executed and rings with so much voice. It's hard to put down even when it's hard to read. And everyone should be reading it. Utterly Amazing submitted by Meginator on July 27, 2018, 9:42pm This book completely lives up to the hype and, in some ways, exceeds it. Starr Carter's voice is powerful and urgent and feels so completely real, a poignant reminder that people in different circumstances aren't so different at their cores. Angie Thomas takes an uncomfortably close, yet vitally important, subject and forces readers to contemplate their prejudice, their assumptions, and their potential reactions to similar circumstances. This book made me uncomfortable, and angry, and sad, and it also made me laugh, made me think, and made me really feel for the characters and their communities. The Hate U Give is one of those books that's so good it's impossible to articulate why, exactly, it is so powerful. It should be read, widely, for a long time. It is a stunning work of art. Couldn't put it down submitted by cmarie2004 on July 29, 2018, 7:50pm This was a good read. Very timely and made me think and look deeper. Thug Life won't be or mean the same. This book packed a punch. Relevant and Powerful submitted by granumm on August 4, 2018, 2:27pm I can't agree more with the other reviewers. The writing is so real and gripping, and it is exactly what we need to read right now. It's a stunning novel, and with this as her debut, I can't wait to read what Angie Thomas writes next. Amazing! submitted by Xris on January 13, 2019, 1:52pm So easy to read even though it was about such a tough and important topic. The relationships between the characters is so real and great to read. I want there to be another book about Starr and her activism!! Loved it and everyone should read it!!! Printz Honor book - 2018. Description: 444 pages ; 22 cm.